Tecan Partnering continuously strives for mutually valuable relationships with our partners. Extensive experience in the development and manufacture of customized automated systems and components allows Tecan to understand and meet partner requirements to the highest degree. Together with Tecan Partnering, you can bring your vision to life. ORTHO VISION and ORTHO VISION MAX Analyzers are the first ever systems with responsive automation for immunohematology in transfusion medicine. Samples can be added on the fly without interruption, STAT and routine tests can be processed, reflex testing, screening against selected cell panels and titration studies for serial dilutions may be run – all on the same instrument. Four analyzer varients were developed in partnership between Ortho Clinical Diagnostics and Tecan. These fully automated systems are used worldwide in blood typing applications such as blood grouping, antibody screening/identification and cross matching. All analyzers are IVD CE-marked. Dako, an Agilent Technologies company, is a world leader in anatomical pathology, with a wealth of experience in immunohistochemistry (IHC) and in situ hybridization (ISH) testing. To meet the needs of pathologists and clinical laboratory personnel around the world, Agilent was looking to offer a new platform that provided their customers greater capacity, higher throughput and more cost-effective processing. In 2011, Agilent chose to partner with Tecan to develop and manufacture a complete solution for fully automated IHC/ISH staining, and the Dako Omnis platform – launched in 2013 – was the result. Since year 2000 Mobidiag has developed and offered novel, innovative solutions for molecular diagnostics of infectious diseases. Amplidiag Easy, developed in partnership with Tecan, automates the nucleic acid extraction and PCR plate setup for all Amplidiag diagnostic products. The Singulex Clarity System is a fully automated, IVD CE-marked system offering ultra-sensitive immunodiagnostics. The system combines full automation, ready-to-use reagents and on-board resource inventory management to provide a streamlined ‘sample in-result out’ workflow to optimize laboratory operations. This integrated solution ensures high throughput and optimized sample management, enabling longer walkaway times and maximizing process safety. Find out more about the SgX Clarity System in Jeff Bishop's AACC 2016 booth talk. RAUDSZUS Electronic in Bavaria, Germany, provides customized front-end sample preparation solutions for milk testing, helping the dairy industry to ensure the quality and safety of its products. Based on the Sias® Xantus® pipetting system, these high throughput platforms enable complete automation of the testing process, and the company has also recently begun offering its customers the option to perform automated ELISA testing of milk for disease and pregnancy. The flexibility of the Xantus platform enables this work to be seamlessly integrated with the routine screening workflow, allowing valuable additional testing without compromising throughput. VirClia Plus is the result of a successful collaboration between Vircell and Tecan, providing high throughput automation of immunoassay-based infectious disease testing. This CE-marked, fully automated system has a capacity of up to 216 tests, and can process 96 tests in three hours. With automatic barcode scanning, custom assay set-up options and the ability to pipette directly from primary sample tubes, it provides a flexible and effective solution for diagnostic labs and hospitals. Patch clamping remains the gold standard assay for investigating ion channels, but the manual technique requires patience and extensive training, and has a low throughput. Danish company Sophion Bioscience collaborated with Tecan to develop the QPatch®, a fully automated patch clamping system that combines the accuracy of manual techniques with high throughput, enabling up to 48 recordings in 30 minutes. The NS2400 is a high throughput neonatal screening system offering quantitative analysis of up to 24 96-well plates per run. Designed to offer rapid, flexible processing for fluorimetric assays, it minimizes consumables costs by eliminating the need for disposable tips without compromising sample integrity. Developed in partnership with Tecan, this platform offers low cost, walkaway processing of a complete panel of neonatal screening assays, including hTSH, PKU, galactose, biotinidase, 17OHP, IRT, toxoplasmosis-IgM and G6PD. All the modules required – including an incubator, shaker, washer, disc remover and reader – are fully integrated into the system, which can be easily customized to individual laboratory workflows. Miltenyi Biotec is a global provider of products and services that advance biomedical research and cellular therapy. Their innovative tools support research at every level, from basic research to translational research to clinical application. Used by scientists around the world, Miltenyi Biotec’s technologies cover techniques of sample preparation, cell isolation, cell sorting, flow cytometry, and cell culture. 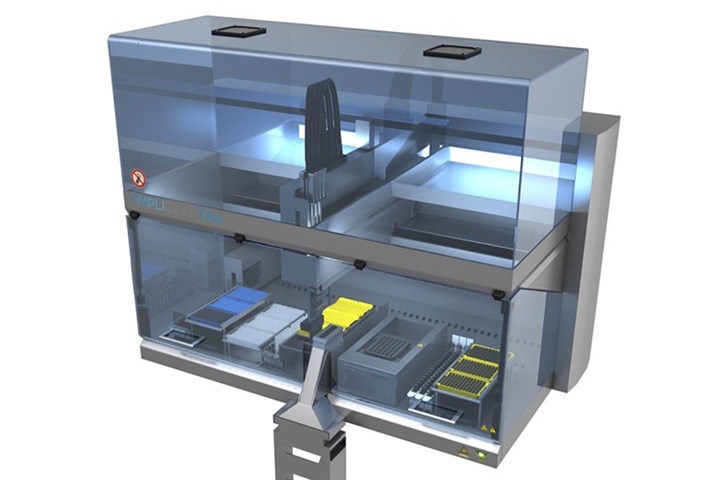 In an effort to provide a high-end fully automated magnetic cell separation platform for high-throughput laboratories, Miltenyi Biotec partnered with Tecan to integrate the MultiMACS™ Cell24 Separator Plus technology into a Freedom EVO® liquid handler. The result was launched in 2017: The MultiMACS™ X, a walk away cell separator with precise and reliable pipetting enabling parallel separation of cells from large sample volumes or sample numbers. Synchron Lab Automation designs and builds customized solutions for automated liquid handling systems in a wide range of industries – from life sciences, petrochemistry and pharma to food and agriculture – developing bespoke software and hardware for each project. The Synchron Xperimate is based on the Sias® Xantus® XYZ robot, and is integrated into 95% of Synchron’s projects. The flexibility of Xperimate allows unique configuration of the hardware –including deck size, pipetting tips, arm modules, and grippers – to suit different demands, while the open geometry and building block modularity of the platform offer high quality and reliable solutions customized for virtually any application. 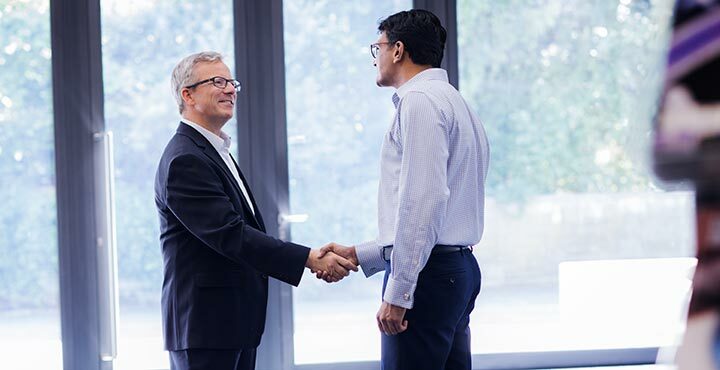 Tecan Partnering has a long-standing relationship with Siemens Healthineers, providing components, OEM instruments, training and technical support across the globe. The Quadriga BeFree® System – manufactured by Tecan – is a high throughput solution for blood screening, and the company also provides service training for Siemens engineers on the unique technologies built into the advanced automation platform. Dako is a market leader in anatomical pathology, and works closely with Tecan for the design and manufacture of a range of fully automated immunohistochemistry (IHC) and in situ hybridization (ISH) testing solutions. The Dako Omnis platform combines Dako’s diagnostic expertise with Tecan’s automation know-how to offer fast, efficient and cost-effective processing of up to 165 IHC or 45 ISH slides a day. High throughput screening for infectious diseases is essential for blood banks, ensuring the biosecurity of supplies and the safety of patients. Chinese IVD company DaAn Gene has chosen the Cavro® ADP and Cavro XLP for its automated blood screening platforms, ensuring reliable operation and minimal maintenance. Istanbul-based Zivak Technologies offers straightforward automation of HPLC and LC-MSMS for clinical diagnostics, food, environmental and forensic testing. The company has chosen the Cavro® Omni Robot to provide accurate and reliable sample preparation, providing seamless integration with its instruments. Milk testing plays an essential role in the dairy industry, ensuring the quality and safety of the end product. RAUDSZUS Electronic in Bavaria provides customized front-end sample preparation solutions to help laboratories cope with the high throughput demands of this work, enabling complete automation of the testing process, and has also recently introduced automated ELISA testing of milk for disease and pregnancy. Automation has an important role to play in molecular diagnostic workflows, minimizing manual interventions to help enhance throughput. 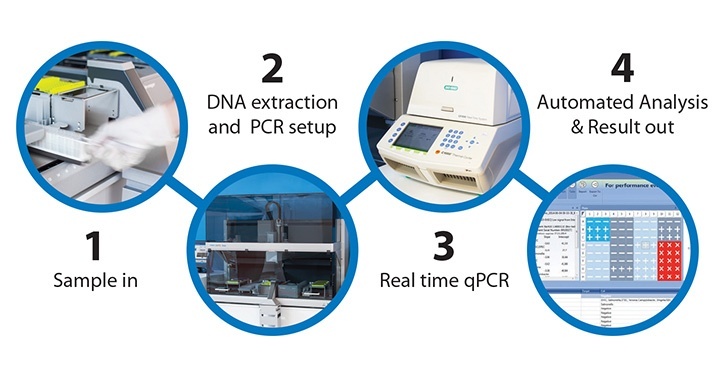 Mobidiag has developed a CE-marked, automated platform for nucleic acid extraction and PCR plate set-up, enabling high volume screening and antibiotic resistance testing for gastrointestinal pathogens. Ion channels regulate many physiological processes, as well as playing a role in many diseases, making them a target for 20 percent of registered drugs. Patch clamping remains the gold standard assay for investigating ion channels, but the manual technique requires patience, and extensive training, and has a low throughput, resulting in ion channels remaining poorly understood. High sensitivity immunoassays allow earlier detection and diagnosis of patient conditions, leading to earlier interventions and better patient prognoses. Immunodiagnostics company Singulex’s unique immunoassay technology allows early detection of even low abundance biomarkers for a wide range of conditions, and the company has partnered with Tecan to develop an intuitive, fully automated platform – the Singulex Clarity® system – which will allow clinical labs to take advantage of this novel technology for routine diagnostics.